Tropical rainforests near water sources throughout South East Asia, including Thailand, Burma, Indonesia, China, Borneo and Timor. They are strict carnivores using ambush tactics (lying in trees and waiting to pounce) to catch birds, dogs, wild pigs, deer, monkeys and other mammals. They are constrictor snakes which means that they kill by squeezing their prey until they suffocate. This species of snake is one of the few that have documented, but not verified, cases of eating people. 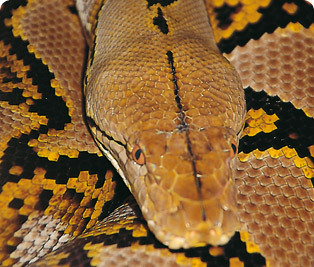 There are around 5,500 Reticulated Python farms throughout South East Asia. They are farmed for their skin and also for their meat which is considered a delicacy in some places. Reticulated Python eggs must be maintained at a temperature of 88-90ºC. To ensure this, the mother will coil herself around the eggs and periodically twitch. The consequent muscle contractions produce a heat source for keeping the eggs at a constant temperature. Low metabolic rates mean that this species can go for long periods of time without food. In 1926 a captive Reticulated Python was reported to go for 23 months without food, after which it continued to feed normally. Although this is the longest snake in the world, it is not the largest. The Green Anaconda can be twice as heavy as a python of the same size. Snakes have jaws which can dislocate to allow them to open their jaws very wide to consume their prey. Reticulated Pythons can actually open their mouths wide enough to eat deer with fully grown antlers!